Popbasic was kind enough to send me their new Frankie collection recently. It just came out a couple weeks ago and seems to be selling fast. I can see why! See how else I've worn these shoes here, here, here, here, here, and here. 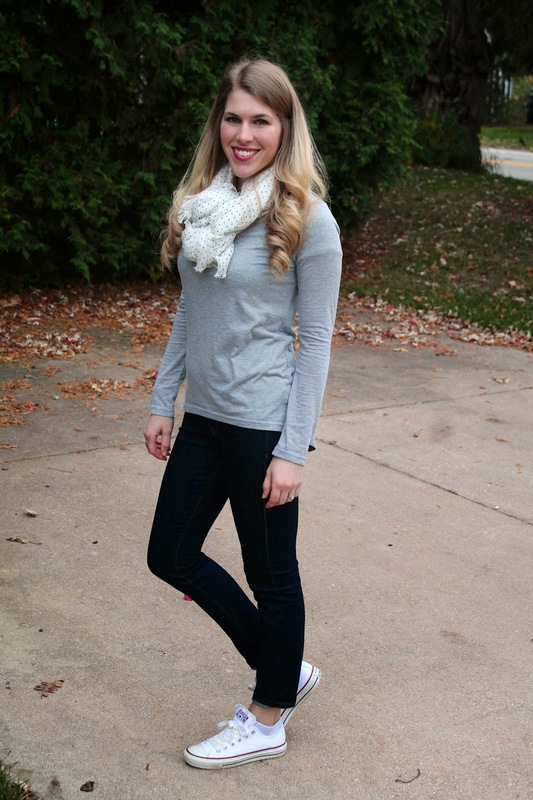 The collection includes this relaxed fit gray long sleeved top, a white belt, and this adorable polka dot scarf. Immediately upon opening the box I was very impressed with the quality. Basic items are real work horses in a closet and need to be made to last. Unfortunately that is not typically the case. Every year I need to buy a long sleeved and short sleeved top in white, gray, and black. This tee is something I know is going to last many years. It's got just enough stretch to be comfortable, but holds its shape all stay and is still incredibly soft. The belt and scarf are just as high quality, too. The belt is leather and the scarf is so silky. It really does pay to get high quality basic pieces in the long run. The best part is you can use my referral link to get $15 off your first purchase (full disclosure, I will get $15 too)! Make sure you check out Popbasic! Great basics and a lot of times that's all you need. I love your comfy, casual look! That tee looks so comfy! 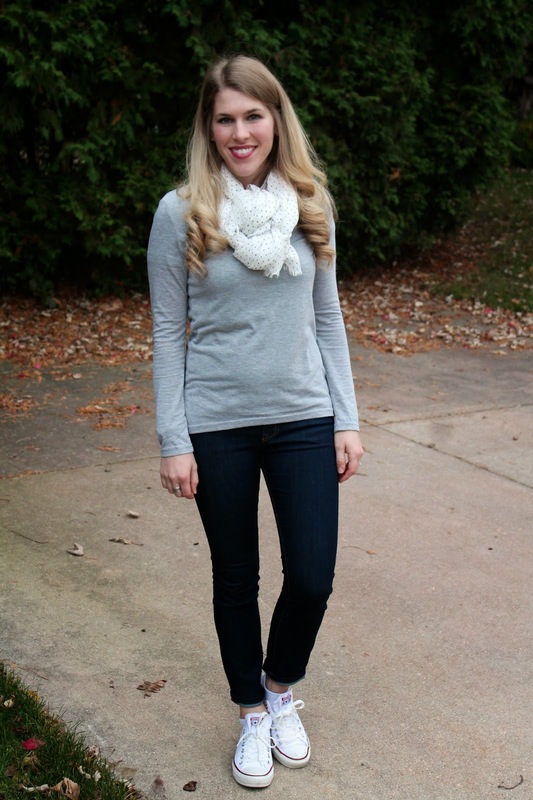 Love the scarf and this casual look! 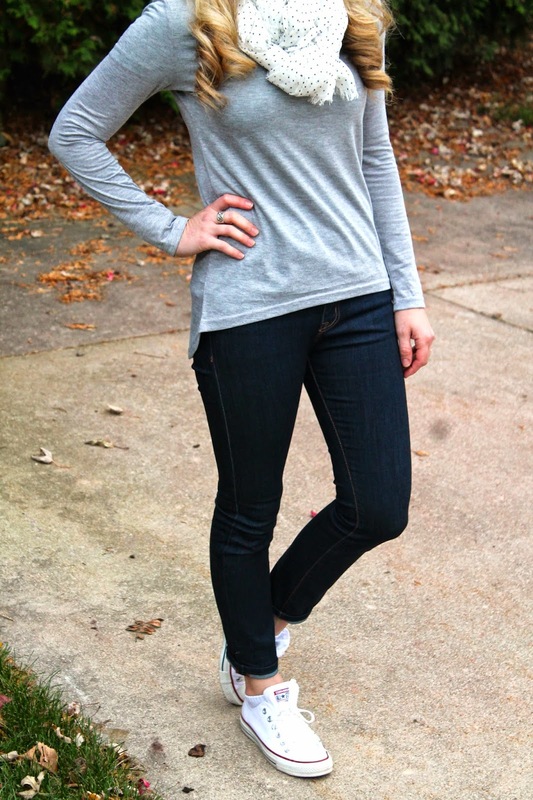 very cute, comfy, and casual. love it--just my style. this look so comfy and cute. Love the scarf. I love Popbasic!! So fun to see this collection on you. I love how you added your converse. Sounds like a great line of sturdy basics! Thanks for sharing! I've been loving the relaxed-fit shirts lately. They are so perfect with a scarf for a cozy fall day! This one looks like the perfect staple! These sound great, a high quality basic is def hard to come by. I just love the polka dotted scarf, so cute!!!! I really like the idea of spending a little more on quality basics - I have a list of basics that I need to replace soon with something better than old navy quality. Honestly, the shirt looks super soft just from the pictures! You have me really me want some white converse. You look so cozy in this outfit. Love that scarf! Quality basics really are a must. I have been buying a new pair of navy ankle pants every year or so, and I'm thinking maybe it's time I invest in a quality pair! I went on their website. What a creative way to sell fashion! Aren't you so lucky to get awesome clothes to review? What a cute and casual outfit! I love how you styled your scarf... how did you do that? I did this: http://www.mrspollyrogers.com/2013/04/a-new-way-to-tie-a-scarf/ then I took the ends and tucked them back in and kept weaving them through the scarf. Hopefully that makes sense! That's my kind of outfit! Love it from head to toe!